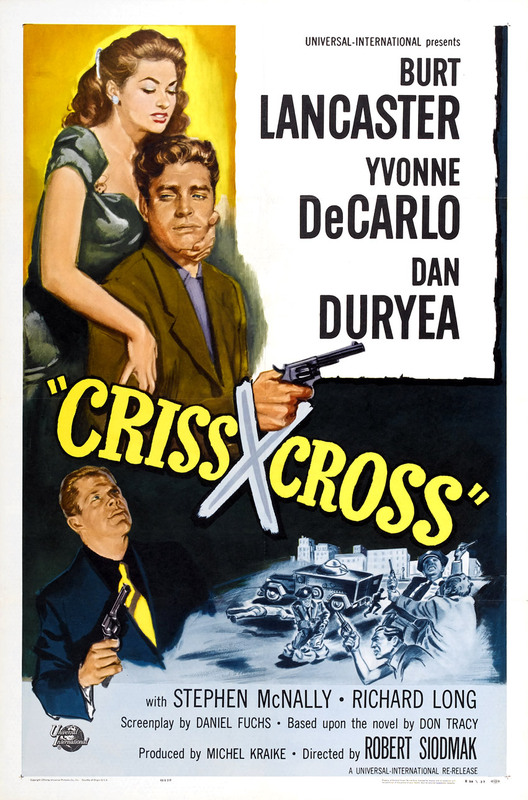 CRISS CROSS hits you like a sucker punch to the gut, delivered hard and swift, followed by a non-stop pummeling that doesn’t let up until the final, fatal shot. Things kick right in as we find clandestine lovers Steve Thompson and Anna Dundee going at it hot’n’heavy in a nightclub parking lot. They go inside, and Steve gets into it with Anna’s husband, the gangster Slim Dundee, who pulls a knife, but the fight’s interrupted by Lt. Pete Rameriz, Steve’s boyhood pal. What Pete doesn’t know is the fight was staged for his benefit: Steve is the inside man on a planned armored car heist Dundee’s gang is pulling off. Flashbacks tell us how Steve got here: he was once married to Anna, and after the volatile couple divorced left L.A., drifting across country picking up odd jobs along the way. Returning to the City of Angels, he finds himself drawn back to their old hangout, hoping to run into the woman that still haunts his dreams. He spots her doing the rhumba on the dance floor, they talk, then Dundee drops by, her latest beau. After getting his old job back with the armored car company, Steve still pines for Anna. The bartender at “their” place gives him bad news: Anna has wed Dundee, and they’ve taken off for Yuma. The star-crossed Steve and Anna meet at Union Station, and she blasts him, saying everyone from his mother to Pete warned her to stay away from Steve, so she wed Dundee in haste. She shows him bruises and welts left by her new hubby, and Steve gets drunk as a skunk, confronted by Pete at the bar. They continue to see each other on the QT, and when Dundee and his boys catch them, Steve swerves the hoods by saying he can set up an armored car job and make everybody rich. To give away anymore would spoil one of the best damn noir flicks I’ve seen in awhile, so you’ll have to watch this one yourselves. In fact, you owe it to yourselves to see this cynical masterpiece from director Robert Siodmak , pulling out all the stops to bring his dark vision to the screen. 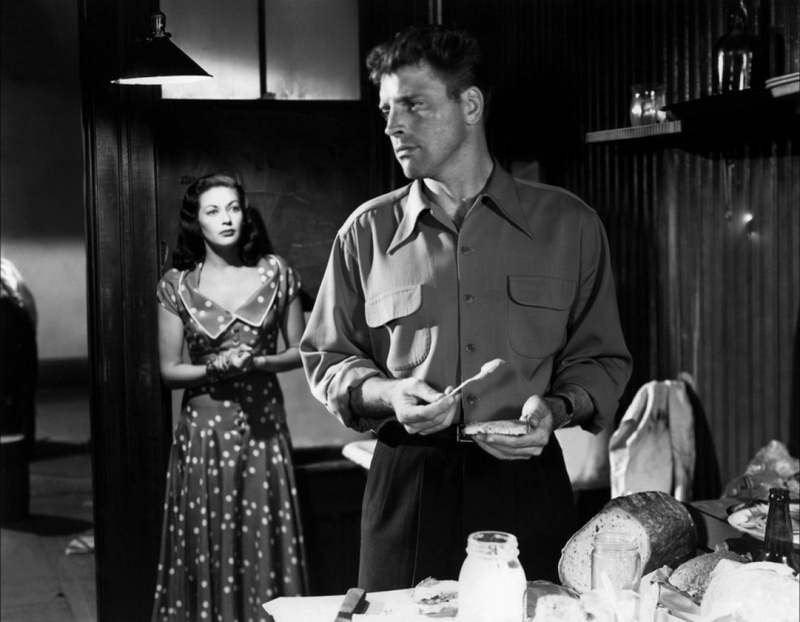 Producer Mark Hellinger died before the cameras started to roll, so Siodmak had no restraints, and this is his finest hour, creating the quintessential noir complete with doomed characters, moody camerawork (by DP Franz Planer), and a sense of paranoia marked by people who know, despite everything, no one here gets out alive. Burt Lancaster’s Steve is a man whose fatal attraction slides him quickly downhill; he knows deep down Anna’s no good, but wants her anyway. 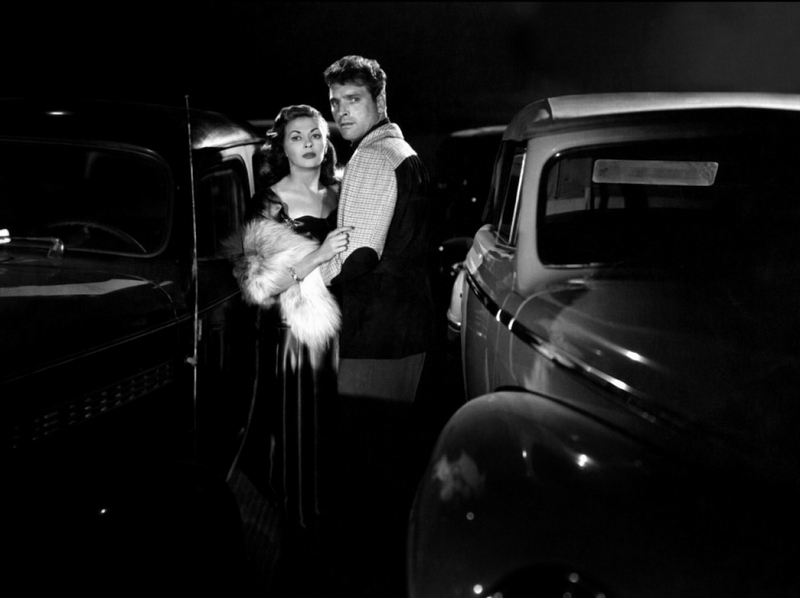 Yvonne DeCarlo steals the show as Anna, the femme fatale that brings everyone around her down to her depths. 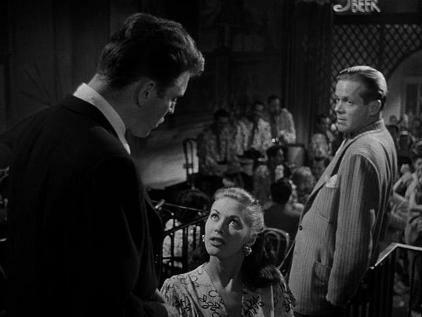 The marvelous Dan Duryea (Slim) tones it down, bringing a quietly menacing presence to his role. Stephen McNally tries to be the voice of reason as Pete, warning Steve to steer clear of these unsavory characters. Even the minor roles deserve recognition: Tom Pedi stands out as a hood with his catchphrase “That’s the ticket”, Alan Napier shines as an elderly criminal mastermind with an unquenchable thirst, Percy Helton makes the most out of his bartender role, and Joan Miller adds to the atmosphere as a barfly. 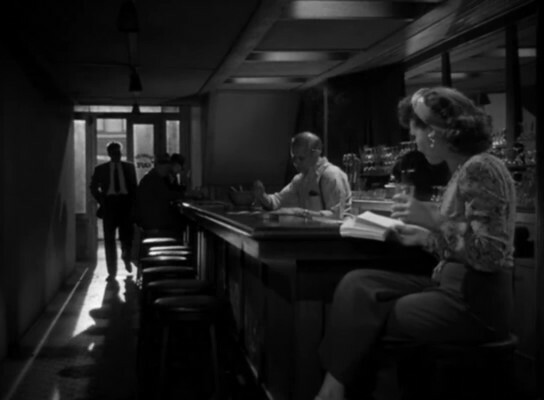 Familiar Faces pop up throughout the film: Richard Long , Meg Randall, John Doucette, Gene Evans, Vito Scotti, Charles Wagenheim, and Bud Wolfe. The young man doing the rhumba with DeCarlo early on is Tony Curtis, making his film debut. All this aided by a superb Mikos Rozsa score (with Esy Morales and His Orchestra providing the rhumba rhythms) add up to make CRISS CROSS a shadowy tour de force from all concerned. This is cinematic dynamite you don’t want to miss, a devilishly good time for fans of pessimistic pictures that will leave you breathless. Highly recommended! Can’t believe I STILL haven’t seen this, after all the great reviews I’ve read. However, I see a person can rent it on YouTube, which is happy news for me. I’m not that familiar with Yvonne DeCarlo’s work, so that’s extra incentive to see it. Looking forward to it! Fasten your seat belt, this one moves like lightning! I agree must see film noir, like most things she’s ever done Yvonne Decarlo is just great. 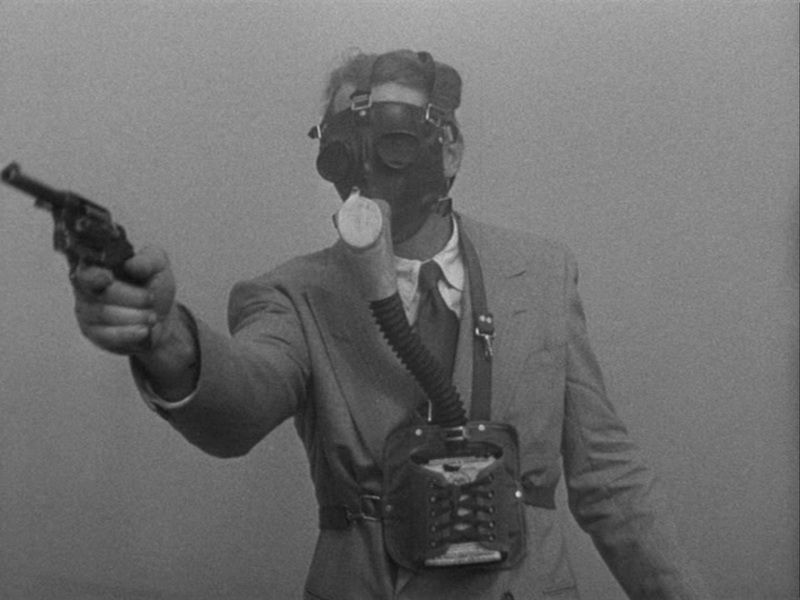 You’ll be happy to know I finally got around to watching “Kansas City Confidential”. Review coming next week!